BREAKING NEWS — YOU DIG? MOVES TO BAND ON THE WALL! YOU DIG? turns six this year and what better way to celebrate its birthday than at Band on the Wall! 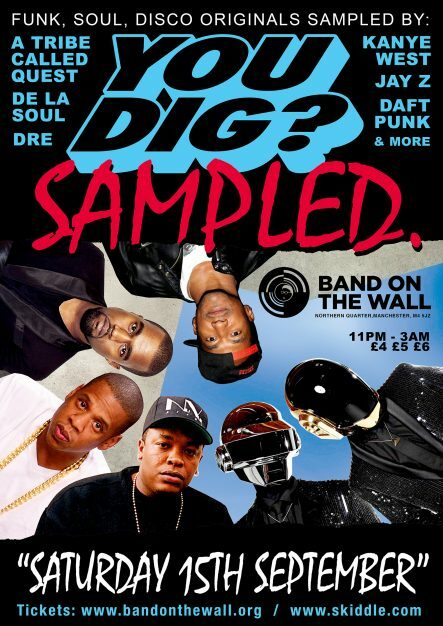 Saturday 15th September will see YOU DIG?’s first appearance at Band on the Wall with “SAMPLED”, a night dedicated to the the original music sampled by artists such as Jay Z, Kanye West, Dre, A Tribe Called Quest, De La Soul, Daft Punk and many more. The YOU DIG? lads pride themselves on digging that bit deeper to uncovering records not readily available and not that often heard on the dancefloor, but all still having a thread of familiarity and guaranteed to make you bust a move. For the last six years YOU DIG has been cooking up a storm with their infectious selections and sell-out parties injecting a breath of fresh air in to the seen, putting YOU DIG? on the Manchester’s Funk & Soul map.